ENSO extremes have slowly but increasingly become a concern to many cities around the globe. It is unclear though how many cities are aware of or concerned about potential threats from an El Niño or La Niña or, if aware, actually takes steps to prevent, avoid or minimize their adverse impacts when they recur some years later. Today, forecasts and assessments of ENSO’s extremes should no longer be of only a passing interest, while city officials await a forecast of the next El Niño. Such forecasts provide usable information for decision makers at all levels of government and in many socio-economic sectors. Improved user-friendly information flow would enable urban areas to address their vulnerabilities to regional ENSO-extremes (e.g. 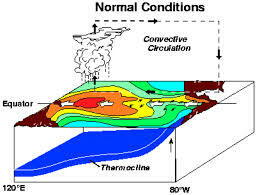 climate, water and weather-related anomalies such as drought, floods, frost, fire, landslides, cyclonic activity). Such extremes should be a constant matter of interest for urban governments, which, in theory, have to respond to forecasts by considering how to prepare for the potential consequences of its impacts. City governments as well as national ones have a responsibility to provide for public safety and well-being in times of potential threatening hydromet hazards, equipping a city to become El Niño ready (ENRC).